Today, representatives of Valiant Entertainment, the Certified Guaranty Company (CGC), and Geppi’s Entertainment Museum are joining together at the Cadmus publishing plant in Richmond, VA to celebrate the 1,000,000th copy of X-O MANOWAR sold since the series’ 2012 debut. The 1,000,000th copy will be removed directly from the presses today at Cadmus by Valiant representatives during the printing of the upcoming X-O MANOWAR #49 and subsequently entrusted to CGC’s renowned team of preservation experts for grading and encapsulation. The one-of-a-kind, 1,000,000th copy – totaling all copies of X-O MANOWAR sold across print and digital in the United States and abroad since 2012 – will then be placed on display at Baltimore Comic Con 2016 before entering the permanent collection of the Geppi’s Entertainment Museum in Baltimore, MD alongside the world’s rarest and most valuable comic books. 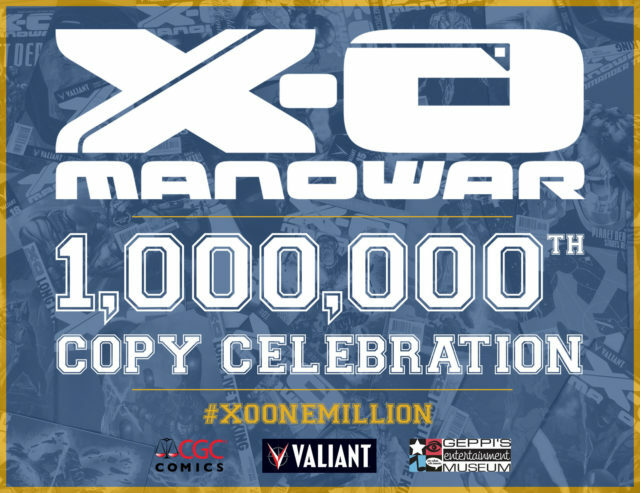 Valiant will also be offering fans at Baltimore Comic-Con 2016 the chance to join in the celebration of X-O MANOWAR’s 1,000,000th copy sold with the X-O MANOWAR 1,000,000th COPY COMMEMORATIVE SEAL. 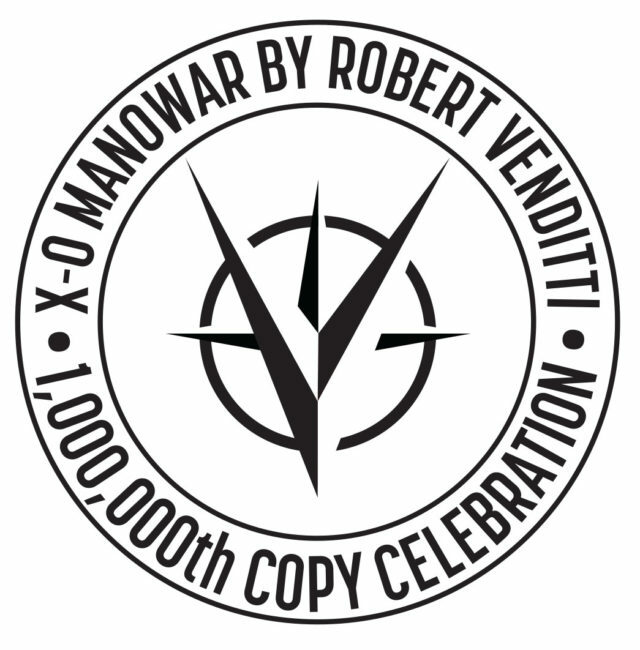 Fans who purchase or provide copies of X-O MANOWAR #49 (any cover) at the Valiant booth (#2008) will be afforded the opportunity to have their copy embossed with an official Valiant 1,000,000th copy seal – designed in honor of X-O Manowar’s legendary achievement and forever commemorating a new milestone in Valiant history – free of charge! “Valiant is privileged to enjoy a storied history with many millions of comics sold, legions of fans around the globe, and tremendous successes spanning nearly three decades. We’re excited and proud to be adding to that legacy with today’s milestone. This achievement, in particular, is noteworthy because it affirms the success that comes with a commitment to storytelling,” said Valiant CEO & Chief Creative Officer Dinesh Shamdasani. 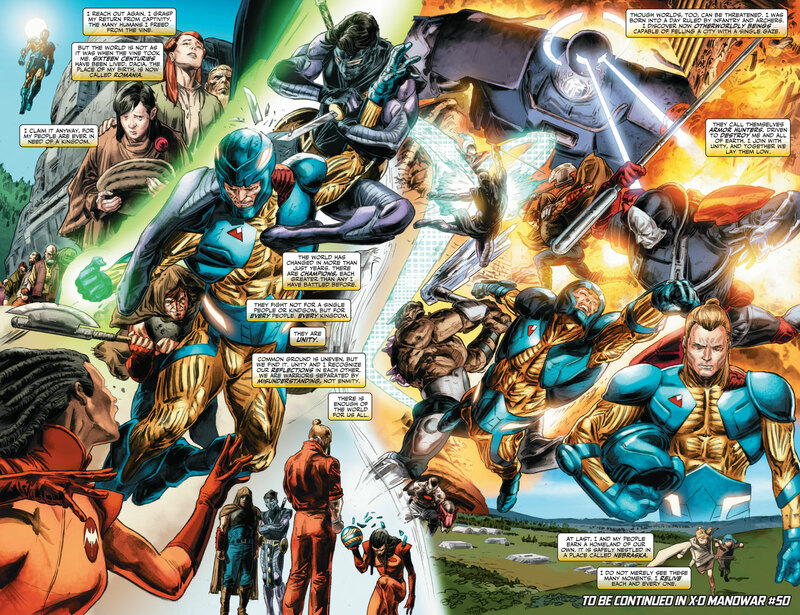 As the launch series of “THE SUMMER OF VALIANT” initiative that defined the Valiant Universe for a new generation, X-O MANOWAR #1 by New York Times best-selling writer Robert Venditti (Green Lantern) and Eisner Award-winning artist Cary Nord (Conan) debuted as the most successful independent series of 2012 and went onto to produce four sold-out printings of its first issue, as well as a myriad of year-end awards, nominations and “best of” citations from the industry’s most prestigious outlets. 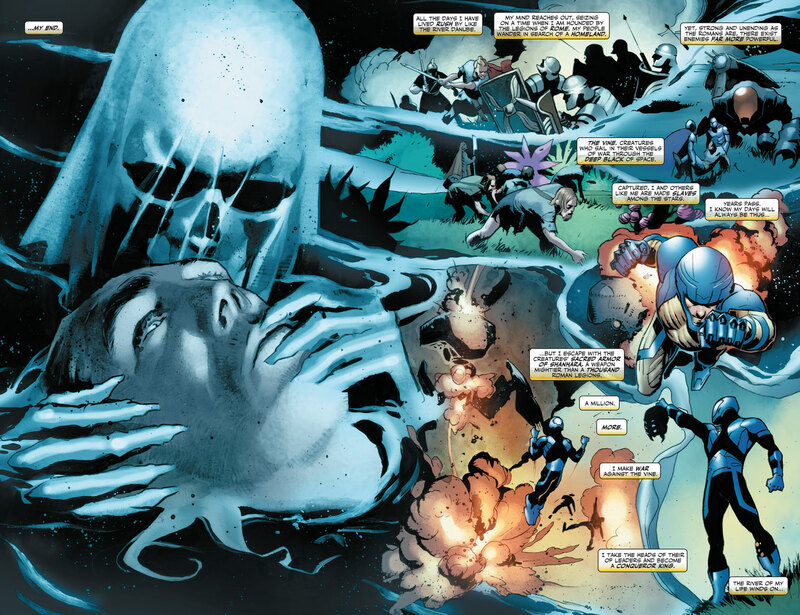 As the impetus for best-selling storylines like “ENTER: NINJAK” and “PLANET DEATH” and major crossover events UNITY and ARMOR HUNTERS, X-O MANOWAR continued to anchor the backbone of Valiant’s award-winning publishing line over the course of writer Robert Venditti‘s unprecedented 56-issue run and set the tone and scale for the rest of Valiant’s acclaimed series that would follow in its wake. 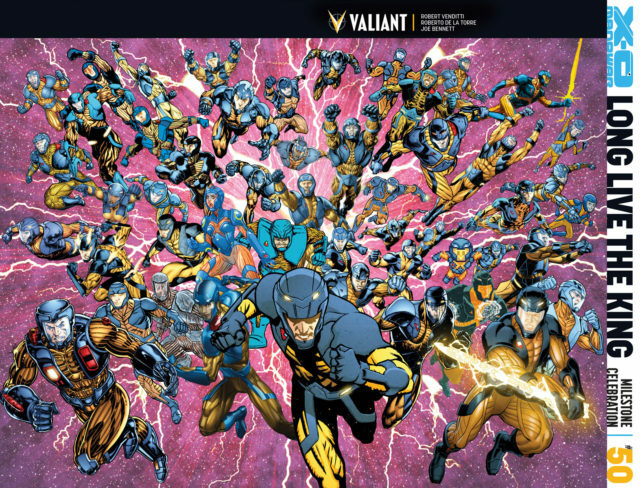 Now, Robert Venditti’s epic tenure is set to conclude with the 64-page X-O MANOWAR #50 series finale on September 28th and, with time, the title that forged the Valiant Universe anew has distinguished itself as one of the longest running and most renowned superhero series of the modern era. 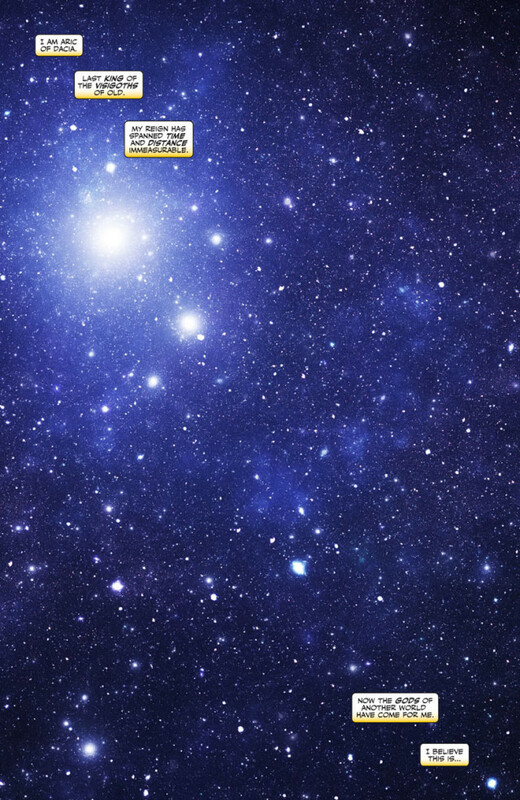 Abducted by a brutal race of extraterrestrials known as the Vine, Aric was forced into slavery on an alien world. Torn from his family, his people and his nation, he spent years plotting his escape…until the day came that he was able to seize a weapon of incalculable destruction – a sentient suit of alien armor – and become X-O Manowar! But now he faces an unthinkable new foe far more terrible than any that have come before… They are The Torment – and their name means death. Thought to be a legend by the Vine, they have now become Earth’s violent reality. As old as the universe itself, they have traveled for eons to reach us…in search of Aric of Dacia and the unstoppable X-O Manowar armor. Can Aric challenge a seemingly omnipotent threat with motives beyond the comprehension of mortal men? Will the armor truly be our world’s salvation, just as the Vine’s myths foretold? And is this the beginning of the end for X-O Manowar – or the beginning of something even bigger? Join the history-making celebration live as it happens today on all of Valiant’s official social media accounts (Twitter | Facebook | Instagram) as Valiant’s staff travels from New York, NY to Richmond, VA to pick the 1,000,000th copy right off of the publishing line alongside special guest Robert Venditti and representatives from CGC and Geppi’s Entertainment Museum. Use the hashtag #XOONEMILLION to follow the 1,000,00th copy of Robert Venditti’s X-O MANOWAR sold on its journey from the printing press and into the annals of comic book history! Finally, X-O Manowar’s march into the history books continues on September 28th in X-O MANOWAR #50 – the final issue of “LONG LIVE THE KING” and a blockbuster tribute to the series that set the Valiant Universe in motion from longtime scribe Robert Venditti and extraordinary artists Joe Bennett (52) and Roberto de la Torre (Daredevil)! Plus: Don’t miss special guest appearances by Cary Nord, Doug Braithwaite (ARMOR HUNTERS), Diego Bernard (NINJAK), Rafa Sandoval (Green Lantern), and Robert Gill (BOOK OF DEATH), Jody Houser (FAITH) & Javier Pulido (Amazing Spider-Man), Matt Kindt (DIVINITY II) & Tomas Giorello (4001 A.D.: WAR MOTHER), Philip Tan (Suicide Squad), and more along the way! Also running through each issue of “LONG LIVE THE KING,” Valiant is marking the road toward X-O Manowar’s landmark issue #50 finale with the X-O MANOWAR #50 COUNTDOWN GIVEAWAY, running through each issue of “LONG LIVE THE KING“! 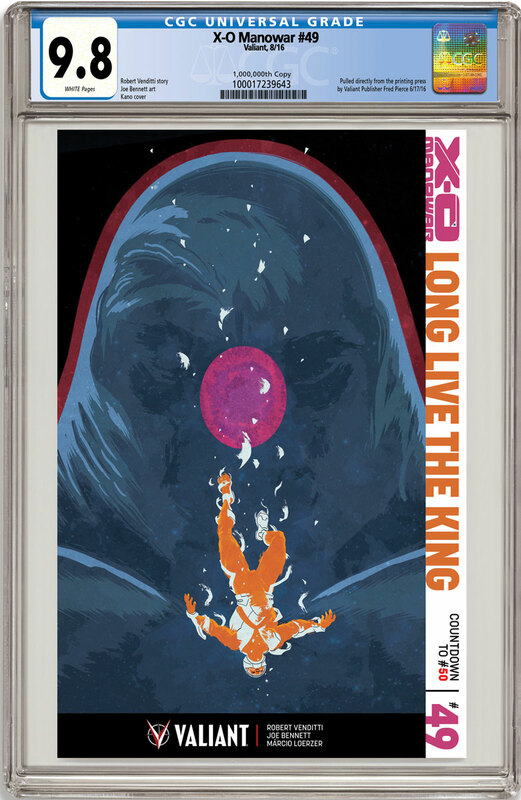 For no extra cost, each issue of “LONG LIVE THE KING” comes bagged with one of 50 exclusive, 4-by-6 inch “micro-prints” featuring the one and only X-O Manowar as realized by a sensational cast of comics’ biggest talents – or full-blown, beautifully rendered original artwork randomly inserted in each issue! Valiant Entertainment is a leading character-based entertainment company that owns the largest independent superhero universe in comics. With more than 81 million issues sold and a library of over 2,000 characters, including X-O Manowar, Bloodshot, Harbinger, Shadowman, Archer & Armstrong, and many more, Valiant is one of the most successful publishers in the history of the comic book medium. Today, the company’s characters continue to be forged in publishing, licensing, film, video games, and beyond. Valiant consistently produces some of the most critically acclaimed comics in the industry and has received numerous industry awards and accolades, including a Diamond Gem Award for Comic Book Publisher of the Year. In 2015, Valiant announced a multi-picture deal to bring Bloodshot and Harbinger to the big screen as feature films.For more information, visit us at ValiantUniverse.com. Founded in 2000, CGC is the first independent, impartial, third-party comic book grading service. A proven and respected commitment to integrity, accuracy, and consistency has made CGC the leader in its field. In 2016 CGC surpassed the mark of 3.8 million collectibles graded. To learn more about Certified Guaranty Company and its many offerings, including magazines, lobby cards and photos, visit www.certifiedguaranty.com. The home of “Pop Culture with Character,” Geppi’s Entertainment Museum (GEM), located in Baltimore’s historic Camden Yards sports complex immediately next door to Oriole Park and directly across he street from the Baltimore Convention Center, is just a few blocks from the city’s famed, tourist-friendly Inner Harbor. The museum exhibits nearly 6,000 pop culture artifacts including comics, toys, dolls, games and memorabilia of every conceivable category. Journey from the late 1700s to the present day and revisit favorite characters like Superman, Spider-Man, Batman, Mickey Mouse, Barbie, G.I. Joe, and many more. Recent major exhibits have included “Steve Epting Originals: Captain America and The Winter Solider,” “75 Spirited Years: Will Eisner and The Spirit,” “The Artistry of Amanda Conner,” and Matt Crandall’s collection of Walt Disney’s Alice In Wonderland, among others. GEM is open Tuesday-Sunday, 10 AM – 6 PM, closed Mondays except for major holidays, and closed New Year’s Day, Thanksgiving Day and Christmas Day. The address is 301 W Camden Street, Baltimore, MD 21201 and the phone is (410) 625-7060.